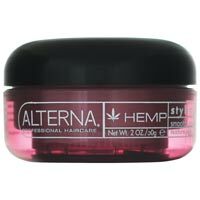 Alterna Hemp Styling Mud is infused with ultra-hydrating hemp seed oil, Alterna's Hemp Styling products protect and strengthen hair while addressing an array of styling needs. A rich finishing tool designed to smooth, shape, define and add shine to hair. Benefits: Blocks out 98% of humidity. Vitamin A protects and moisturizes the hair and scalp. Creates a soft finish with shine and manageability. Provides styles with incredibly memory. Directions For Use: Emulsify a generous amount in palms then apply to desired areas. Style and shape with or without heat. Try some today or give to a loved one as a gift anytime of the year. Pair it up with a cool hemp tote bag.